In the sculpture of James Murray, space, interval, and matter are constructed together with a vigor and finesse that frequently defy expectation. 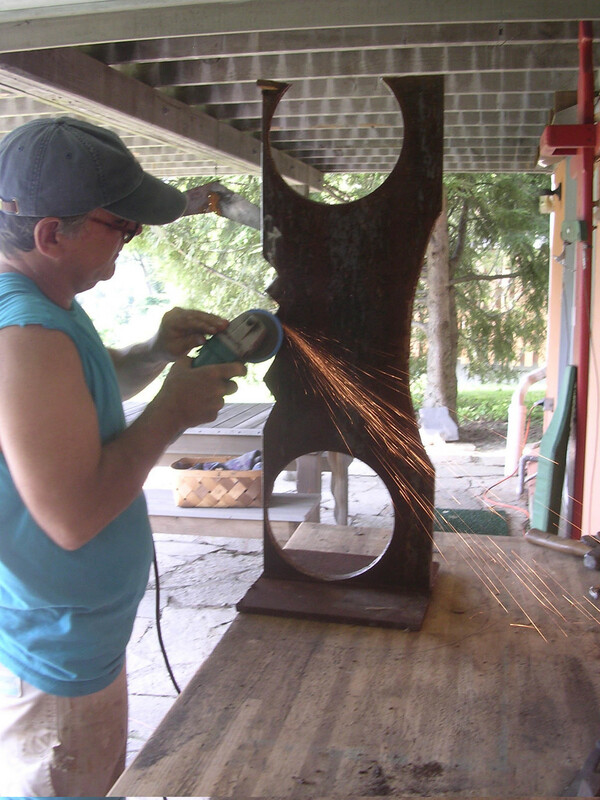 Murray initiates his work through an all-inclusive approach to new and pre-existing materials. The sculptor plays as well with the viewer’s mind in Home Equity, a fixed yet skewed stack of houses, carved in wood and later cast in aluminum. Like his abstract pieces, the simplified house shapes tilt to the point of imbalance while they are held in check by invisible lines of force.. The sculptor also relies on his skills acquired as a contractor evaluating crumbling infrastructures to rebuild them with boldness and refinement. In this context, he works with scale, using his precise contractor’s drawings, and finishes with fine woods and veneers. Keeping the underlying discipline while responding to the eccentricities of both his materials and his internal rhythms, Murray’s sculpture process breaks free. He works spontaneously without preparatory drawings hacking bold surfaces, mitering, joining, welding, and bracing to call on a vast experience with materials and processes. Fissures erupt from natural causes of swollen wood split open or nudged by Murray’s forceful chisel. Murray ties them together with new or weathered bracing while delighting in the mysterious scars and splits. Murray’s restless world of form and surface encompasses: serial blocks of wood and stone, framings of all sorts in wood and metal, port holes, concentric bent-wood circles made airborne and floated together, and blunt metal tacks randomly aligned and spread over chiseled planes. To mine the intersection between the uncertainty of a raw split and the clarity of a fine polish or visual balance, Murray selects new materials or halls in cast offs from man and nature. Near his studios on the Hudson River and on Martha’s Vineyard, Murray gathers flotsam that he dries for a year or more until it is stabilized. Over that period of time as the material sustains a hold on the artist’s imagination, it becomes ready to be turned into sculpture. For Murray “materials with a pre-existing life history have a purpose and shape to be reworked as sculpture. I am always on the hunt for sculpture materials, harvesting them as an unban archaeologist.” As in the 6 foot 6 inch high piece BQE (aka Brooklyn-Queens Expressway) road finds, metal scraps, human cast offs are welded, bolted, and altered to form twisted and arresting images.